Carotenoids market size was over USD 200 million in 2015, increasing with estimated gains at over 4%. Rising consumer and manufacturer preference towards carotenoids owing to its high value in the pharmaceutical, food, and cosmetic industry should fuel industry growth. These products are not only limited to act as an important precursor for amino acids in feedstocks, as well as have coloring and antioxidant properties, which is driving product penetration. Rising demand for curing high cholesterol, blood pressure, obesity, and diabetes has led to an increase in product demand in nutraceutical industry. Global nutraceuticals spending was over USD 165 billion in 2015 and is foreseen to surpass USD 340 billion by 2024, increasing at over 7% CAGR up to 2024. Consumers globally are implementing healthy lifestyles to gain optimal nutrition to reduce diseases, leading to an increase in nutraceutical consumption by health-conscious consumers. Growing health concerns and an aging population are key influencing factors fueling global market size in daily foods, medical foods, and dietary supplements. North America was the largest nutraceuticals market in 2015 accounting for over 35% of the global revenue, followed by Asia Pacific accounting for over 30% and Europe at 24%. Rising health awareness among consumers is anticipated to facilitate overall market growth. Growing geriatric population has contributed to faster overall national health spending growth. Both medicaid and medicare spending per person is projected to grow in coming years. In food industries, these areas a coloring additive to restore coloring and to standardize the food products coloring in pasta, fruit juices, beverages, margarines, sausages, and cheese. They also act as precursors to various chemical compounds having in foods flavor, including alkaloids, and flower fragrances. In feed, these pigments are used to intensify the chicken skin, egg yolk, fish, and milk color. Plantation expansion in Latin America and Asia has resulted into oversupply which may impact market trend. Synthetic carotenoids market size generated over USD 190 million business in 2015. 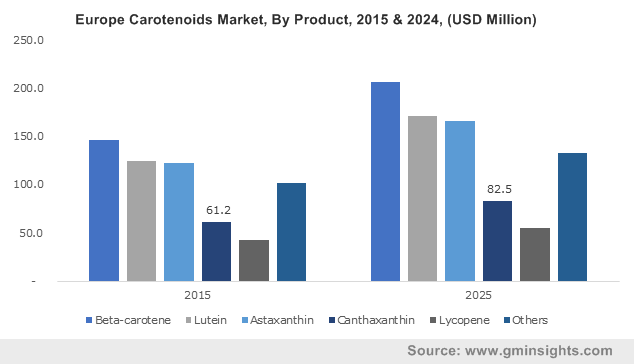 Shift in consumer preference towards naturally resourced products mainly in Europe and North America is facilitating natural carotenoids market growth over its synthetic counterparts. Animal based carotenoids market is limited in supply owing to reducing crabs, and shrimps’ availability. Comparatively high prices and limited availability is driving plant based carotenoids ingredients demand. Industrial production can be carried out through biotechnological processes using yeasts, filamentous fungi, microalgae or bacteria and solid-liquid extraction from plants. Rising consumer consciousness awareness has prompted to the development of the green label product trends. Consumers are ready to pay higher costs for natural ingredients based food & beverages in the U.S. and Europe. The carotenoid generation through chemical synthesis or extraction from plants is restrained by low yields and high production cost. This prompts research towards generation and commercilaization of microbial carotenoids market as an option that has demonstrated better yields. Agro-industrial wastes is proposed as a low-cost substitute carbohydrate source. Beta-carotene market was valued at over USD 40 million in 2015, and is expected to increase at over 4% CAGR up to 2024. Healthy skin, eye health, and cardiovascular disease prevention with addition to this ingredient in diet and supplements has fueled product demand. Canthaxanthin market accounted for over 10% of the total market in 2015. Rising consumer inclination towards various food products such as breakfast cereals, baby ingredients, dairy, meat, fruit & vegetable, bakery & confectionery, and snacks industries should drive canthaxanthin market size growth. Canthaxanthin have application in cosmetic as an artificial tanning agent. It is deposited through body including in the layer of fat below skin which turns into orange brown color. However stringent FDA regulations on canthaxanthin usage in tanning pills may restrict industry growth in this segment. Food & beverage carotenoids market size was valued at over USD 50 million in 2015. Acting as an additive in food and beverages by maintaining adequate vitamin A levels, and enhancing immune systems, healthy skin, and a good vision are key properties driving industry growth in this sector. Cosmetic are foreseen to surpass USD 25 million by 2024. Growing demand for organic and natural cosmetic products, in the U.S., UK, France, Germany, and Italy should drive carotenoids cosmetics demand. Antiaging properties, reducing wrinkles, and acting as color additives in lipstick and lip care products are driving industry growth in cosmetic segment. Germany, which dominates Europe market size, was valued at over USD 20 million in 2015. Processed food industry expansion was among the key contributor in regional industry growth. France and Germany exhibit the strongest demand as a food colouring agent. Italy, Russia, and Germany were among the top ten marketplaces for dietary supplements in 2015. Russia is among the major consumers for nutraceuticals in Eastern Europe due to rising aged population. Ageing population of Russia has created a huge market for carotenoid based anti-ageing skincare products and dietary supplements. China market is set to increase at 4.5% CAGR up to 2024. Technological advancement, increasing application scope in nutraceuticals and cosmetics, and growing consumer affordability are driving regional industry growth. The demand for dietary supplements and functional food is projected to witness notable growth. Global market is fragmented and highly competitive with top two industrial players BASF and DSM accounting for over 50% of the total capacity in 2015 and extensively involved in the R&D. New product development and development are foreseen to be a growth strategy. New and existing patents relating to ingredient extraction, production, and application are responsible for highly competitive nature of the market. Other industry participants include Allied Biotech, Brenntag, Carotech, Chr. Hansen, Cyanotech Corp., D.D. Williamson, Divis Laboratories, LycoRed and Naturex SA. Carotenoids are significant molecules in various industries including chemical, pharmaceutical, poultry, sustenance and cosmetics. These pigments are not only act as vitamin A precursors, as well as they have coloring and cell reinforcement properties, which have pulled in the consideration of the enterprises and scientists. Product generation through chemical combination or extraction from plants is constrained by low yields that outcomes in high creation costs for the global market. This prompts to research of microbial production, as an option. Lycopene, Beta-carotene, Lutein, Canthaxanthin, Astaxanthin, Zeaxanthin, and Capsanthin are majorly found carotenoids.The commercial carotenoids are developed by extraction from vegetables and chemical synthesis. The synthetic process generates hazardous wastes that can adversely impact nature. Growing preference for microbial production use as substitutes over its synthetic counterparts as food colorants. Thus, microbial synthesis offer a promising alternative.